Last night, Ronald Kalifungwa and I returned from South Africa, where we went to attend the funeral of a dear friend and ministerial colleague, Martin Holdt. The family was gracious enough to allow us to attend the burial in the morning before we attended the memorial service in the afternoon. Both events were conducted with God-glorifying dignity and simplicity, befitting the man who was being remembered and whose remains were being buried. I have no doubt that tributes will continue to flow from around the globe in honour of this Mr Valiant-For-Truth. This is my own contribution. I first met Martin Holdt in 1990. I read in a Banner of Truth magazine that the Reformed Baptist Association had been formed in South Africa. Keen on linking up with them, I wrote to inform them about the budding Zambian Reformed Baptist movement. I was invited to attend their next RBA event, which was a training session for black South African pastors. One of the most memorable events there was hearing Martin preach. 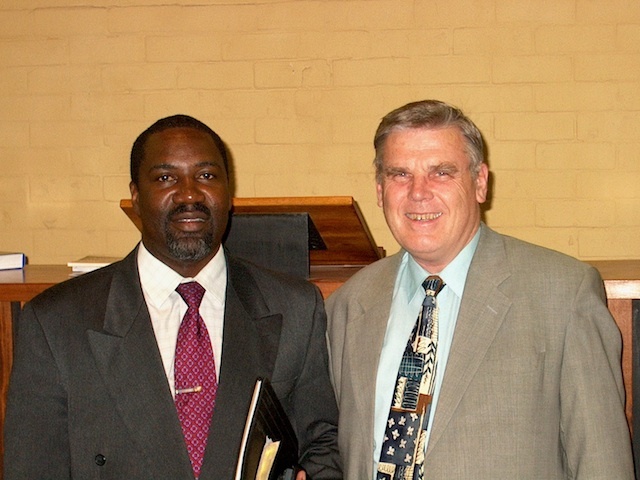 I returned to Zambia and told the brethren about this powerful and unforgettable preacher. Later in the year, Ronald Kalifungwa and Choolwe Mwetwa accompanied me for yet another visit to the RBA training sessions. When they heard Martin preach, they understood my excitement and we determined to get him to preach in Zambia. In August 1991, Martin Holdt came (together with Vernon Light) to preach at our small conference. His commitment to preaching in general and to Zambia in particular spoke volumes to us because he left his wife in South Africa fighting with cancer. In the end, he had to leave a day earlier because she suddenly turned for the worse while he was with us. Since then, Martin became an elder brother figure to the burgeoning Reformed Baptist movement in Zambia. We owed a lot to him and learnt a lot from him. Martin Holdt was a true encourager of the brethren. It was because of him that I got a bicycle in 1990, which was to be the chief means of transport for me for the next six years. The church had bought me a bicycle to use in my pastoral work, but it was stolen within a week of its being purchased. 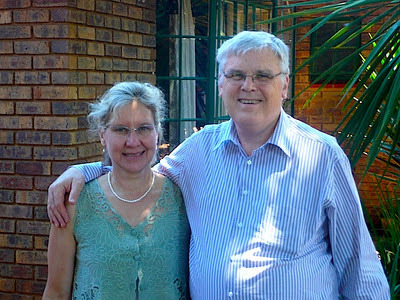 Upon my arrival in South Africa, a few days later, I told Martin about it, and he, unbeknown to me, also told some friends of his (Nico and Anita van der Merwe) about it. 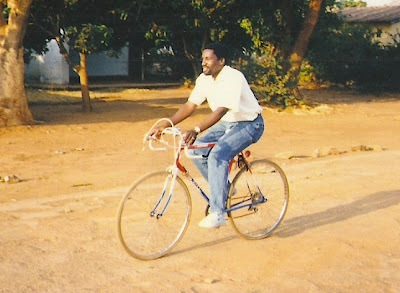 Well, as I was leaving to return to Zambia, Nico and Anita showed up with a brand new bicycle—with gears—and I took it back with me to Zambia! I often wondered what the thief who stole my previous “Third World” bicycle must have been thinking, seeing me riding my new bike. I am sure he wished he had waited a few days before pouncing on my home. He would have stolen better booty! Martin was also the man who opened the door for my international preaching ministry. He took the risk. It was because of him that I first preached outside Zambia. The first was in South Africa in 1990 and it was at Emmanuel Baptist Church where he pastored. It was also because of him that I first preached outside Africa. 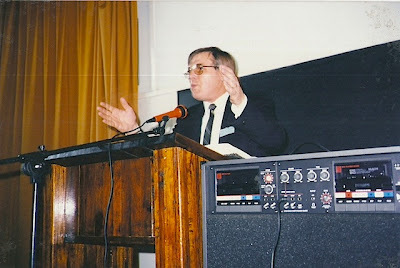 He had been asked to preach in Canada in 1992 at the International Baptist Conference in Toronto, but he had to turn that down due to his wife’s ill health. Martin then recommended my name and then wrote to me asking me not to be afraid if I got the invitation. I got the invitation and accepted it with fear and trembling. Thus began my international preaching ministry. In the first decade of this ministry, I often discovered that it was Martin Holdt who first suggested my name to conference organisers wherever I was invited. When Kabwata Baptist Church finally obtained the piece of land on which we have since built our church auditorium, offices, and ministry centre, Martin made it a personal project to help us raise funds for the building project. He ensured an account was opened in South Africa for this purpose. He also often made appeals whenever I was preaching in South Africa for congregations to give towards our building project. He even seconded to us a handyman (Glen Carlson) from the USA to help us. Hence, in the initial stages of our building project, most of our support came from South Africa. Martin was a man of prayer. Often when we would talk on the phone he would tell me, “My brother and fellow partaker of the heavenly calling, I pray for you everyday.” I wish I could say the same to him. During his memorial service, his daughter brought the cushion on which he knelt for prayer. It was totally worn out. She said that was also the condition of his knees and elbows. I must say that his prayer life put mine to shame. I should also add the fact that Martin spoke directly into my life whenever he thought things might not be well with me. On one occasion, after I returned from preaching in South Africa, he wrote to me asking if all was well with me. He said that my preaching had lacked unction and a few people had expressed concern about it. He thought I sounded brash and arrogant. On another occasion, he had heard from some brethren that I was studying with a liberal university and was very concerned about it. Whereas others were content to whisper to one another about it, he wanted to discuss the matter directly with me. On both occasions, I appreciated his forthrightness. There were also a few times when we locked horns on doctrinal subjects. We still remained friends despite those times of intense fellowship! 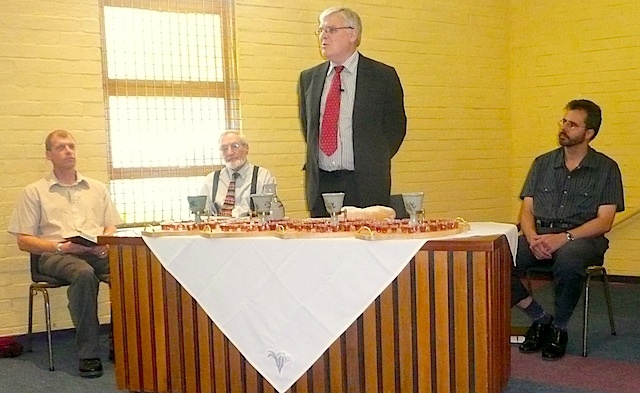 The first lesson that I learnt from Martin Holdt was to have a single-eyed devotion to Christ. Everything about him revolved around Jesus Christ, as a living and mighty Saviour. This is what informed and inspired his preaching. This is what made him love the church and continue serving in it until the very week of his death. The church was the bride of Christ and the apple of his eye. Martin was willing to spend and be spent for its health and prosperity. He was content to let the world go by—to know no gain or loss—as long as God was glorified, sinners were saved, and the church was edified. 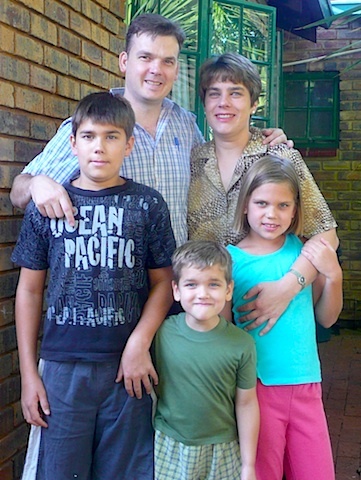 The second lesson that I learnt from Martin Holdt was to love one’s wife and children. In the early years of my knowing Martin, I often ended up being hosted in his home. I observed the tender affection that he had for his wife, Beryl, and children. When his wife was ill with cancer, one could observe how he made her comfort the centre of his attention, until she went to be with the Lord. His greatest longing for his children was their spiritual well being, and on a number of occasions we prayed together for them. Another lesson I learnt from Martin Holdt was that sound doctrine was worth fighting for. Martin spearheaded the resurgence of the Reformed Faith in South Africa, especially among Baptists. He was behind the formation of the Reformed Baptist Association—as a rallying point for Baptist churches of a Reformed persuasion in South Africa, enabling them to pool their resources together for the furtherance of the work of God in South Africa. He also spearheaded the formation of Reformation South Africa, a magazine that kept Christians challenged and informed about the progress of the Reformed Faith in South Africa. As he fought valiantly for the truths of God’s elect, he did so with charity. Thus, to the end, he remained within the context of the Baptist Union of South Africa. 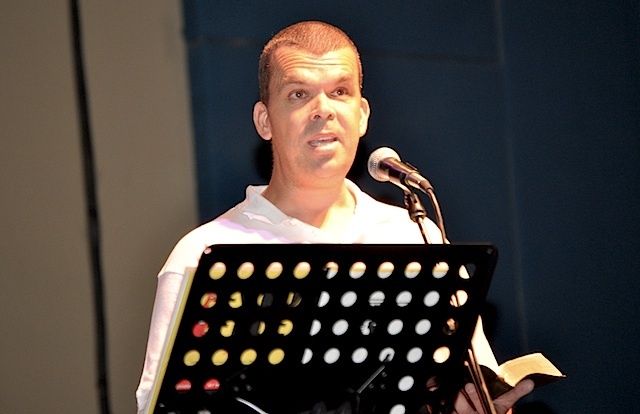 Yet another lesson that I learnt from Martin Holdt was not only to seek to preach in the power of the Holy Spirit, but also to seek to raise up preachers with similar aspirations. No one can doubt that Martin was one of the greatest preachers in South Africa towards the end of the twentieth century. The Spirit of the Lord was certainly upon him. He often pleaded for prayer that he may preach with unction. No doubt, God heard the prayers of his people on behalf of his servant. Martin, however, wanted to see this high sense of call to expository preaching to be more common in the pulpits of South Africa. Hence, he often held schools of preaching for this purpose. He also started a journal, Preaching and Preachers, which aimed to encourage preachers to preach effectively. Martin Holdt also loved books. He not only was an avid reader but he also encouraged others to read good books. 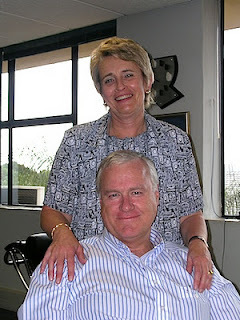 When he was at Emmanuel Baptist Church he encouraged the growth of the Barnabas Bookroom and during his last pastorate at Constantia Park Baptist Church he also encouraged the growth of the Augustine Bookroom (run by his wife, Elsabe). At every conference he was involved in, he not only ensured that there was a good book-table but he also personally advertised the books. He gave away hoards of good books. I am one of those who benefited from his large heart. Our own church’s Evergreen Christian Bookstore draws inspiration from his example. The last pulpit Martin Holdt preached in outside South Africa was the Kabwata Baptist Church pulpit. 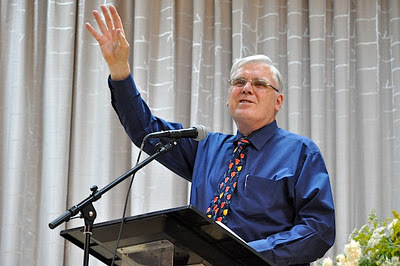 By an act of providence, last November he came to Zambia to preach at an inter-church married couples one-day conference, which was hosted at my church. I missed the event as I had only arrived from Brazil that same day. However, the next day, having preached at Lusaka Baptist Church in the morning, Martin preached at Kabwata Baptist Church in the evening. He looked rather tired, but he summoned the energies in him to preach from the text, “Examine yourselves to see whether you are in the faith” (2 Corinthians 13:5). He pleaded with us to seek salvation in Christ. I am glad that the Lord gave me one more chance to meet this valiant knight in shining armour, who had done so much for the cause of Christ in southern Africa. He has now gone to his reward! Martin Holdt preaching his last sermon at KBC, as if saying, "Farewell my friends!" Thank you so much for taking the time and trouble to write this tribute. MH was an inspiration and a very great challenge. I am grateful to have met him and to have benefited from his ministry at the Banner here in England. It is indeed with sadness of heart that I learn of the passing on of our dear beloved brother in Christ. Who can forget his love for expository preaching, God's people, his way of preaching; fitting Dr Lloyd Jones’ definition of preaching (logic on fire), his attempts for great things of the kingdom of God? It must have been last year or the other year when I was kicking myself for having missed his preaching engagement here in Sydney. I got mixed up with the dates. So my last memories of his preaching were back in Zambia at a Family conference. He was preaching a Christian blessed hope. He preached like a dying man to dying people. As he preached, he took us up into the heavens, there we saw the blessedness that awaits us as believers and he graciously brought us down to earth as he encouraged us to press on. I can remember the silence in the auditorium as he described the death and burial of his first wife and related it back to the blessed hope we have in Christ. Yes, well said, he has gone to his reward. O that the Lord may raise men like him!! May we imitate him as he imitated Christ!! He was trully an amazing man, I thank the Lord for sending Martin Holdt into my own life. I have much to be thankful for regarding this man whom I considered a Mentor and a Friend. Where he is now, I long to be. May his legacy continue in zealous prayers and Christ central, Word filled Preaching. I just read your excellent tribute and found myself thinking "Amen!" time and again. It was certainly a privilege to know Martin. I think you captured his devotion to God and the people his life and ministry touched - there will certainly be a crowd of us rejoicing with him when we meet again! I also enjoyed the warm reminders of my treasured times in Zambia. Glen!!! You are on the planet?? Wow, it is great hearing from you, though at a sad time for the church militant in our corner of the world. One of these days you need to come and see what the KBC compound looks like so many years after your initial labours here. All I can say is, "The Lord is wonderful!" Well, I know the KBC family is not one to allow the grass to grow under its collective feet - I tried using Google satellite a couple months ago to see the plot from an aerial perspective, but could not locate it! Things just look different from the satellite perspective than they do from the seat of a bicycle or Kombi. If the Lord should see fit to burden me with sufficient surplus funds the first thing on my list will be to bring my boys (Micah and Seth) to see the best parts of Southern Africa which would certainly have Lusaka as a primary feature. I hope your family are well (Felistas, Mwindula, Mwansa and Mwape, if memory serves) and the church is thriving under your excellent leadership. Yes, God is good! I learnt of the passing on of Pastor Martin Holdt from a blog I was following. It is really of great benefit that we could be refreshed with his life from this blog and just the impact that he had on a person whose labours have had a subsequent impact on some of us. I have fond memories of Pastor Conrad Mbewe on his sports bike, arriving at my former church, Lusaka Baptist to preach at our Young People’s meeting. I can now see who was responsible for the bike that wheeled him to our treasured meetings in the early 90’s. I first came across Pastor Holdt at Lusaka Baptist in the 90’s not long after I got saved. When I learnt of illness of the wife I was touched and move to remember her in prayer from time to time. I was deeply affected when later I heard that the person I had continued to pray for had actually already gone to be with the Lord (I had not been getting updates of her wellbeing, but just prayed). Although I was not known to Pastor Holdt, I was burdened to take pen and paper and write a letter of condolences to him (we had no Internet then). I was really touched and humbled to receive a letter of gratitude from him. It was no small thing for me, especially as a young Christian, to receive a letter from the great preacher I knew him to be. I will cherish the cassette tapes of his sermons which he sent along with the letter. His response to a person he knew not personally, spoke volumes about his simplicity and humility. May the Lord be the great comfort of the family and church he has he has left behind. Thanks for promptly removing it. I couldn't live with the misspelling of that word. A glorious tribute to a man who loved His Lord and served God's people faithfully to his dying day. Listening to him at the Couples' Conference last November, he sounded somewhat subdued, but the personal snippets in his delivery were driven home to our hearts with incisive power. The history of the reformed faith in Africa in general, and Southern Africa in particular, would not be complete without him. May the Lord comfort his family and his church. We will surely miss this valiant soldier of the truth.